The US employment data helped the USD grow along with the labour market. EURUSD will also be affected by German WPI m/m and German Final CPI m/m for EUR and the 10-y Bond Auction, Wholesale Inventories m/m, JOLTS Job Openings, and NFIB Small Business Index in the US. Since yesterday this pair has continued its bullish trend and there have not been any pullbacks on the way. The support rests at 1.10340 with resistance at 1.11120 which both lines are below the monthly pivot point at 1.11470. The EMA of 10 is still below the EMA of 100 but it is moving with bullish bias. The RSI is reaching above the 50 level, the MACD indicator is moving in neutral zone and the Stochastic may have reached its highest range and might fall at any time. Despite the pair’s bullish bias EURUSD is still in bearish zone. 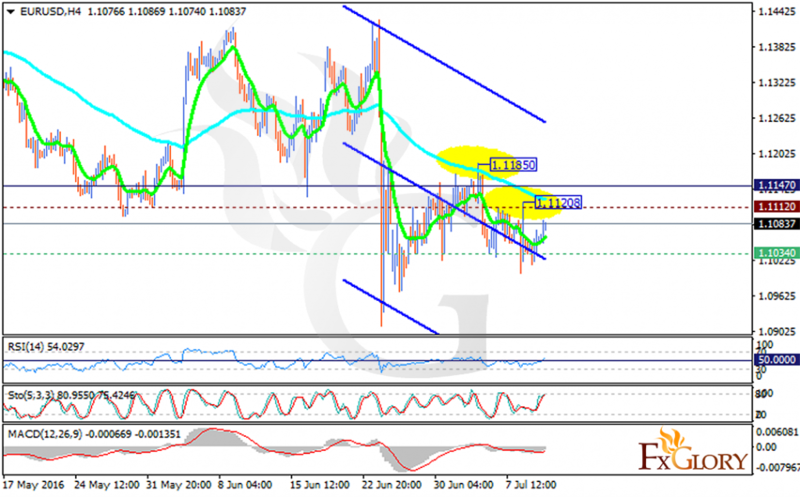 The upside trend will be limited around the resistance zone and the fall will target 1.0821.